Although we knew Gravedust’s purpose in going to Gastonia, I don’t think we had worked out the circumstances of his departure from his tribe. Parts of this read as if he had prepared specifically for this journey (“it was wise to spend a portion of my savings on a good pair of sandals”). But it is possible to interpret this in a way that lines up with what we later decided: that Gravedust went on walkabout the same time as the other mystics did, under some pressure to leave before Iver turned his people against mystics altogether. He evaded the assassins who came after his fellow mystics because unlike his fellows, he settled on a destination more concrete than mere enlightenment. When you’re hunting multiple targets and expecting them all to take wandering paths, the one who goes in a straight line can get away without ever realizing you’re there. He almost looks surprised in the 3rd panel. Gravedust was always one of my favorites. “You don’t belong here!” he wails to the guy who is clearly leaving. “You don’t belong here!” wails the guy who insists on sticking around he mortal plain past his designated departure time. What IS it with these “Blood and Soil” types? I figured Gravedust managed to unintentionally evade the assassins because he went to the one place they couldn’t go… Gastonia. Thinking of Arkerra as an MMO puts a different spin on “the spirits of the dead continue to occupy this world”; they’re waiting for rez. 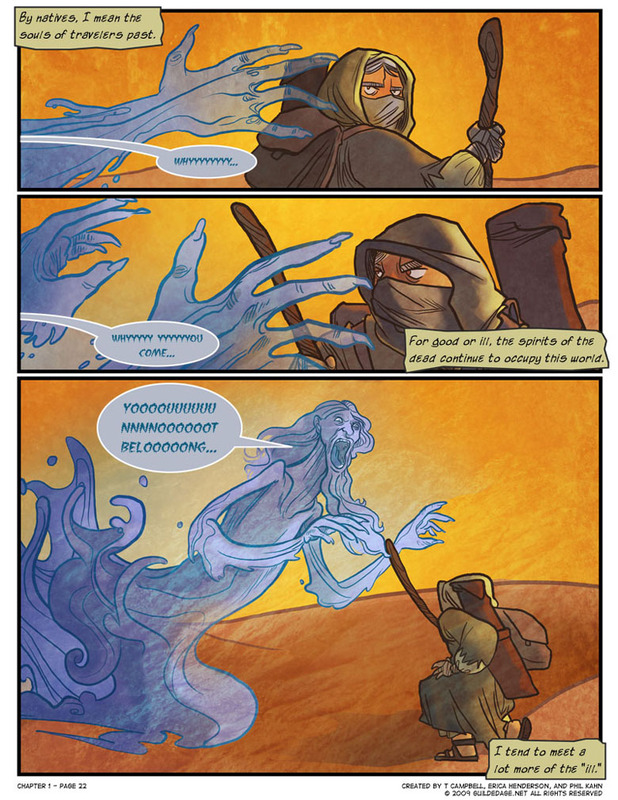 Is the ghost made of water, or is that just Gravedust hallucinating? Eh, looks like ocean water either way. Besides, we know Gravy can sustain himself on a cup of green tea every fortnight. I loved the bit about the cost of robes and sandals. The story works in bits of MMORPG mechanics but it always feels organic, not jarring. Later on, when Harki the faction boss talks about always respawning, it is tragic and very fitting, not ha ha why bosses always rez. The ghosts were a lot creepier-looking back here. I wonder if that was just the change of artists, or was it a conscious decision to tone them down after a while? I think it was the difference between an embedded grudge ghost, and the ones summoned from their corpses shortly after death. The time hasn’t worn down their person-ness yet.